With highs that top out around 40 degrees and lows that dip well below the freezing point, weather in Indianapolis isn’t always conducive to a stroll through the park or a walk downtown. However, this doesn’t mean you should abandon your love life or date night. Indianapolis has plenty for couples to do indoors during the cold season, and if you’re brave enough, several activities to do outdoors. Don’t let your spouse or your future spouse down. Check out these excellent winter date ideas in Indy. If you and your date are sports fans, hop on over to an Indy Fuel game at the Indiana Farmers Coliseum. A member of the ECHL and a Chicago Blackhawks affiliate, the Fuel are your chance to see the NHL’s next big stars as you share a smile and fun with your date. Throughout the year, the Fuel offer giveaways and discounts, such as the Do317 Night, where beers are $3, hot dogs are $1, and t-shirts are $7. The Fuel has also had date nights in the past, offering a free rose to the first 1,500 fans through the door. Plus, you can do the entire thing on the cheap with tickets ranging from $14 to $44. An added bonus is that if you’re already dressed for the cold, you might actually feel warm even if you’re right next to the ice. Perched on the 22nd floor atop the Hyatt Regency hotel, the Eagle’s Nest is a rotating restaurant that provides delectable cuisine and premium cocktails. At a height of 268 feet and with a sweeping 360-degree view, this restaurant offers a spectacular perspective of the entire city. When the lights go down, the twilight created by the buildings provides a romantic backdrop to your evening. Open from 5 p.m. to 10 p.m. nightly, the Eagle’s Nest offers farm-to-table cuisine that includes steak, lamb, salmon, duck, chicken, and vegetarian options. Grab a bottle of wine from around the world and two glasses to polish off the evening in romantic style. Willing to brave the cold for romance? Then book a ride with Yellow Rose Carriages. Started in 1983, Yellow Rose is Indianapolis’ first and best horse carriage ride company, offering a romantic lift from either Monument Circle or the Hyatt Regency. If you’re eating at the Eagle’s Nest, a Yellow Rose Carriage ride is a no-brainer, offering rides from 25 minutes to an hour. Each carriage is designed to mimic carriages from 100 years ago, while LED lighting adds a romantic touch. Drivers are well-trained and dressed in tuxedos to add to the experience. If it’s cold out, don’t worry too much. 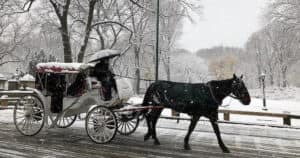 The drivers stock the carriage with blankets for you to stay warm, and if not, make sure to pick up a hot chocolate from one of downtown’s finest coffee shops or baristas. Don’t suffer from loneliness, boredom, or cabin fever this winter. Instead, follow these date night tips, stay warm, and you’re in for an experience you won’t soon forget.